Tuesday (The end of the T-Jack era) edition: Wha' Happened? *Given the opportunity on a national stage, under abnormal circumstances, to seize an unbelievable opportunity, Jackson led the Vikings to exactly three points. *On one of the simplest things there is in football -- a handoff to the running back -- Jackson collided with The Franchise, temporarily disabling both players. *With the Vikings in position to get back in the game after a long punt return, Jackson threw the kind of terrible, crippling interception that would have been understandable three years ago but not now. *After Brett Favre started 297 games -- say what you will, but that's tough -- Jackson twice left the game and gave way to Joe Webb. That is not tough. We don't care if he later returned. Not tough. 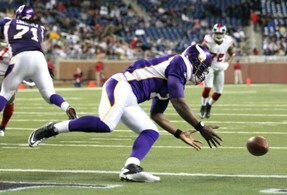 The Vikings are back to square one at quarterback. Jackson is not the answer. Webb is nowhere close to ready. And Favre is not coming back. These are things we were fairly sure of before last night. After last night, we are positive.